ART KLUB KIDS BRASS JAM is coming back this Spring! We are super excited to be partnering with ArtCamp504, the Preservation Hall Foundation and the New Orleans Jazz Museum to bring you this weekly music curriculum! Kids Brass Jam is a reoccurring educational program that teaches, mentors and inspires students through music instruction on trombone, trumpet, sousaphone and drums. 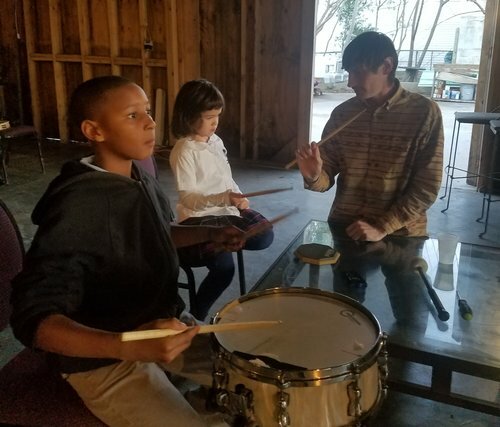 Thanks to the support from Threadhead Cultural Foundation, Preservation Hall Foundation and the New Orleans Jazz Museum , we are able to offer this unique music curriculum. We will be connecting the music with the culture that birthed it. Students will explore from where the music came and how it has evolved over time, paralleled with the cultural evolution of our fine city New Orleans. The students will have an opportunity to explore all of the instruments, however please let us know which instrument your student is most interested in playing. Some instruments will be provided on site but it is best if your musician has their own. Please let us know if you need information on renting an instrument for the duration of the session, if your child will need to borrow one while at the Art Klub, or if they already have their own. In addition to the brass music lesson, we also offer homework support. Students may arrive 30 minutes early and/or stay 30 minutes after the music lesson for help with homework or support in reading or mathematics comprehension. We have a tutor available to work with students on their homework. Midway through the 8 weeks, a Preservation Hall All Star musician will come to lead the students in a special music class- thanks to the Preservation Hall Foundation! We strive to instill a love for playing and listening to music with community centered programming. 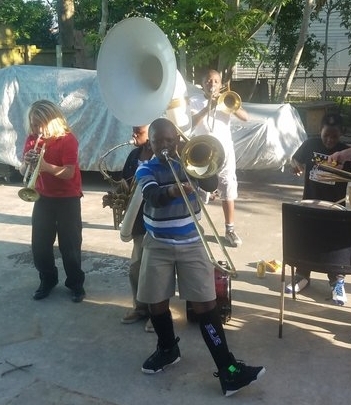 At the end of the 8 week session we will host a concert played by our Art Klub Kids Brass Band, lead by our teaching musicians and members of Preservation Hall. Witness the magic of New Orleans brass band traditions and Louisiana music and cultural heritage played by the promising talent of the St. Roch neighborhood and surrounding 504 area youth musicians, in an amazing night of big brass music and New Orleans rising talent. The Kids Brass Band will also be invited to play alongside local musicians for our summer kids parade at ArtCamp504 Parade Camp! We have partial financial-need scholarships available for students that receive free or reduced lunch. Please email ArtCamp504@gmail.com if you are interested in applying for a scholarship.